These days, I am far more interested in self-acceptance than in further improvements. Seems to me that a good deal of pop psychology is thinly veiled self-rejection. Of course, I want to continue to discover more about life and myself. I just don’t want to miss the quiet knowing that has always been present. I’ve often wondered if we close the door on the current year too quickly, racing toward the next room and the promise of where we’re going, rather than savoring where we’ve been. This year I’m feeling it even more, perhaps because we’re rushing not just to a new year, but a whole new decade. Be more. Be better. Be happier. Be smarter. Be healthier. Be fitter. Be kinder. Be stronger. Be wiser. Be organized. Be focused. Be disciplined. Be loving. So what if we found another way to negotiate this transition from one year to the next? What if, instead of riding through the streets, Paul Revere-style, shouting, “My life is coming, my life is coming,” we stopped for a moment. Got off the horse. And quietly acknowledged, no matter how sublime or difficult the past 365 days were, no matter what we did or didn’t accomplish, that we were enough. That life was enough. And will be so again next year. It’s been said that a full, rich life isn’t actually made up of achievements and attainments, goals set and goals met, but rather moments, experiences, and feelings. Walking on Bodega Head on a late spring day: blue ocean merging with blue sky. Monthly lunches with my brother Steve. Being with Leo on the journey from near-death back to full life. Words, ideas, insights. A life of their own. Doing what they want. 4th of July. Occidental, California. And there’s Dad, still going strong at 88. A down comforter when the temperature drops. Cooking, experimenting, making a mess. Dave right by my side. Gratitude each work day for the gift my clients give me: letting me into their lives. Lazy Sunday afternoons in bed. Talking and making love. Jonathan Young telling the story of Hansel and Gretel. A wake-up call: My mother-in-law’s death. My own tears and sadness. Feeling misunderstood. Sea Ranch. That week in September. Summer dinners. A long table under the trees. Coming together. Evan, John, Janice. Deb and Barry. Reading, outside, on the day bed. A favorite: The Ten Year Nap by Meg Wolitzer. Sun, wind, rain, moon, cold, hot. Practicing mirroring with Dave. Listening. Truly listening. My neighbor, taking on his own roof replacement. A month of early morning hammering. A month of marveling at his tenacity. Discovering that I still missed my mother, even 35 years after she was gone. Literally watching the garden grow. 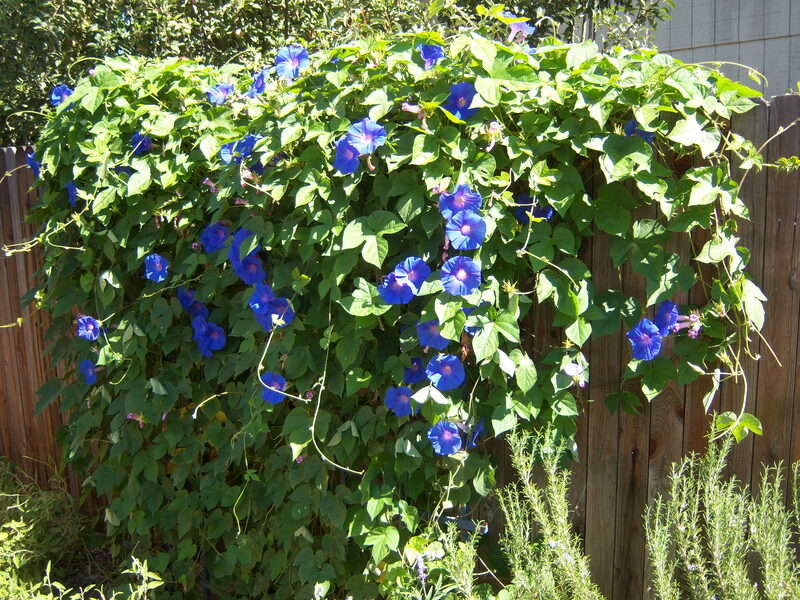 Who knew a morning glory could sprawl so far, so fast? OK, I’ve got to stop! I’ve opened the flood gates; it’s pouring out of me and I could keep going. And when I give my heart and soul to this memory making, there’s a boatload of goodies, expected and unexpected. My memory is the library of my experience. I will read there often. Which is not to say I don’t respect striving and ambition and forward movement. I’ve done my share, and expect I will continue to do so. And I’ll also continue to support it in others, because, hey, I’m a counselor and coach. After all, it’s part of my job description. But I’m also in a business and on a path that leads me to recognize that too often the striving and ambition masks a deeper yearning: to have a fuller relationship with life itself, to honor “the quiet knowing that has always been present,” that Jonathan Young speaks of so eloquently in the quote above. So as both the year and the decade wind down, let’s all celebrate that quiet knowing within ourselves. I invite you to share one of your own scenes or stories from the past year. A memory. A moment. A feeling. An experience. Whatever you like. Because each of us will be enriched by it. On a final note, I wish all of you – readers, commenters, clients, friends – the most joyous of holidays. This is my last post of the year. As some of you know, I’m a firm believer in taking time off. I’ll be around some of the time, responding to comments and such. I’ll also be unplugged for a time, too. But don’t hesitate to leave your thoughts here. Be assured that I will read them all. HMMM, I WONDER WHERE THE ADVENTURE WILL TAKE US NEXT YEAR? This post is a beautiful gift, thank you! I love everything you say in it, my heart sings reading this. Yes, yes, we are here to experience beautiful moments, loving moments, heart string pulling moments. We are here to harvest love and I am harvesting your love for life. Thank YOU for all your lovely writing and pulling my heart strings, they and I love that. Thank you so much, Wilma! Your words are beautiful, and I love what you say – “We are here to harvest love.” So I send you much love back and the wish for many more of those moments in the coming year, for all of us. BEAUTIFUL from beginning to end. Every word. I respect ambition and hard work and am quite familiar with both. But so much of our potential for happiness is diluted by our desire for “more” or “better”. And I’m learning more and more that it’s not only okay but it’s a great day when I’m able to start from and go back to a place of “peace” and “plenty”. That I can look back at my day (or year or decade) no matter how many things didn’t go as I hoped, and see what went right, what brought me joy and what fills me with hope going forward. Wilma is right. THnak you for this beautiful gift. Oh, thank you, Belinda, for your moving words and insight. That place of peace and plenty that you write about, of “enough-ness,” can be so anchoring. And hey, I’m still learning it too. But I feel something shifting in me, and recognize that it truly is possible. Wonderful post. Such a great way to wrap up the year. Thanks for sharing your year with us. Here are a few of the scenes from my year. Vacationing in Georgia with 50+ friends in our Jeep club, for three days of driving around in the woods and being outside in nature. The feeling of immediate release from stress, minutes after being laid off from my job. The joy of three months with my family while I was unemployed. The joy seen in my wife and daughter when we brought home a new kitten. I’ll stop there, it’s been a great year. It had ups and downs like any year, but it’s full of great memories. I’ve got a big smile on my face, Eric. It’s hard to stop those scenes from rushing out, isn’t it, once you get going? I was a little surprised by that when I started my own memory making. But I think those moments want to be remembered. Just goes to show how we all truly do lead lives that are at once both extraordinary and ordinary. Profound and simple. I love knowing that. Thanks! Magnificent Patty! LOVED this post – what a terrific attitude! And so funny you should bring this up. I sometimes feel myself getting exhausted from all the hype of being all the things you mentioned “better, wise, organized….” ad nauseum! As much as we may all need some motivation/inspiration in our lives, boy don’t we ever forget to just be and love ourselves and do nothing and BE OK with that? I don’t know if its just me getting older or what but loving my present moment and all who are in it seems quite enough, thank you very much! Constant striving seems to negate thriving – I’m feeling a post comin’ on here – uh oh! haha! You just have yourself a fabulous holiday – enjoy every moment! Hi SuZen – Thank you! And boy do you say it so well. It sure can feel exhausting, kind of like constantly being pushed and nagged at. I love what you say – constant striving seems to negate thriving – and I can’t wait to read that when you write it. Seems like there must be a middle ground that’s gone missing these days. Love and hugs right back to you. I slowwwed down while reading this. Thank you for the opportunity to go inward and reflect. Your blog brought me back to that awesome day I spent with you & Dave at your PDI at the ICDC conference where you unvelied the draft of your new book, “Finding Your True Self…”I am looking forward to a break in the routine so I can get into that reflective mindset and start re-connecting with my true self again. Hi Julie – So great to have you visit – welcome! I don’t often get comments from colleagues, so I’m honored you stopped by. I well remember that day you talk about; what an amazing group of people in that room, and you were such a huge help. And it’s interesting you mention the book. I think all the blogging I’ve done this year has been priming me, getting me ready to go back and finish it. Thanks so much for your comment. -Making new friends in my office – going to lunch, chatting in our cubicles, and laughing. -Being in my friend’s wedding. -Sitting in the park at lunchtime, noticing the leaves on the trees. -The process of buying a home. -Changing, growing, letting go of things from the past. Hi Amanda – Lots of good memories there for you, it sounds like. I hear laughter, nature, community, belonging, inner work. Nice! This is a very important post. Yes, we do need to stop and reflect on all that we are and where are journey has taken us. Tomorrow will come soon enough as will new curves and bumps in the road as we continue along our adventure. Thanks for this gentle reminder to appreciate who we are at this moment! Why, thank you so much. You’re so right – tomorrow will come soon enough. It always does, doesn’t it? Love this! I find it’s always a good question to ask myself, “Am I doing more striving or thriving.” When the answer is striving I know I’m out of balance. I just had a friend ask me yesterday where I see myself in 5 years. I replied my vision for myself in five years is the same vision I have today. Happy…living in my truth, peace and love in the present moment. If I can do this to the best of my ability everything else will fall into place. I’m in a support group and the next meeting will be about living goal free in 2010. It seems out of the norm doesn’t it? It is what I need right now. When I’m tied to my computer, or goals or the face pace of change I only strive with a feeling of ongoing anxiety. Not something I’m willing to wallow in at the start of the new decade. I want to be more about authenticy and calm and that only happens in the present with love and peace within. Hi Tess – Oh, I love that – living goal free. Sounds like a wonderful group. There’s such a difference between living life and constantly going for goals. I have this hunch that the goals take care of themselves when we just live our lives. So many stories seem to support this. I think you’re really on to something for the new decade. I want to be there too. This post really speaks to me. Lately, it seems everyone is focused on themselves and their self awareness, self improvement, self actualization. We are not here alone. Looking outside ourselves can be healthy. Thinking of others first can change the world. It is good to improve, but accepting ourselves and moving forward can be the most important thing. Great post, great site. Nice work. Hi Erin – Welcome, so glad you stopped in for a visit. And thank you for your lovely comments. Isn’t that the truth about self-acceptance? I actually believe that if we could do more of that, we would in turn be more accepting of others. Hi Sara – You are definitely enough! I experience you as a very wise and creative woman. And thank you for letting me know this brought a smile to your face and a moment of insight. Great to connect with you through Sara’s blog. Your uplifting energy is an inspiration. Peace & blessings 2U. Welcome, Liara, and thanks so much for your lovely comment. I really appreciate it. Dear Patty, This is an OUTSTANDING post, an outstanding insight. I just LOVE this. You are wise indeed, and this is a wisdom that goes “beyond” the surface hoopla, that goes deeper that we are taught, that erases all the static and brings our lives calmly and gently down to Earth, like a feather drifting gently through all the chaos to land softly upon the ground. This is a “breathe” deeply, lovingly, embrace-it-all wisdom that you have given us. I applaud you from my heart for seeing through all the “static” to the single peaceful feather landing with perfection. This just made my day, because it is when we embrace it all that we truly see who we ALREADY are…right now, right here. Hi Robin – Such a delight to have you visiting here again. And what compelling imagery – the drifting feather that is perfection itself. You’ve captured exactly the experience and feeling of life being enough. Right before I read your comment, I received an email from a friend with this quote: “May you be content with yourself just the way you are.” So I count it as a serendipitous moment that this quote and your comments are so wonderfully aligned. Thank you so much, and hugs and love right back to you. I have been joyously discovering so many people writing similar ideas and lists as we linger on instead of running headlong into an artificial pedestal for ourselves and the year ahead. It was refreshing to read through your post and notice both your uniqueness, as well as a commonality many of us share, but usually miss noticing. Thanks for sharing! Thank you for your lovely comments. I love the duality you mention: our uniqueness and our commonality. The paradox is wonderful, and so much the truth of life. This is great! Thanks for sharing. The reflection list is amazing. Hi Ralph – Welcome. Thanks so much for your kind comments!